Welcome to the HEATWAVE Experience! Whether you are an avid ‘Soul’ or ‘Motown’ enthusiast or are looking to ‘strut your stuff’ on the dance floor to hot funky disco tunes and modern dance grooves – Heatwave is your answer, one of the funkiest Melbourne cover bands. Offering a flexible range of line-up options ranging from 6-piece to 12-piece, Heatwave Band can tailor a package to suit your event, from intimate weddings to full-scale corporate shows.Tight and funky, the band features strong vocal harmonies and a rhythm section dedicated to grooves that keep you groovin’. Heatwave entertains audiences with a broad repertoire, combining classics by artists such as Marvin Gaye, Stevie Wonder, Aretha Franklin and The Jackson Five with the funky tunes of today’s popular dance artists such as Madonna, Scissor Sisters, Jamiroquai and Kylie. 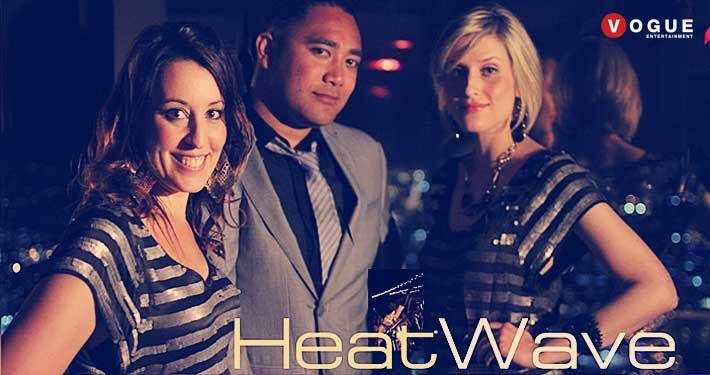 With a sound popular to all age groups, Heatwave guarantees an energetic and soulful experience. Heatwave’s extensive performance experience and impressive song list means we always have the right tunes to suit the mood of your evening. Our versatile musicians and male and female vocalists have all styles of music covered, from Frank Sinatra and Nina Simone to Nicki Minaj and NeYo – and everything in between. And our repertoire is constantly growing as we add more classic songs and recent Top 40 hits. We have developed an exciting collection of tried and true, sure-fire dance hits that work with almost any crowd, young or old. We’ve also developed a great ability to read a crowd, and can pick up on what styles will work best as the evening progresses. Let us know your preferred styles and we can cater accordingly.